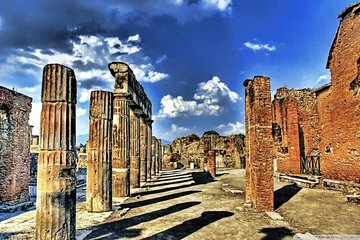 Explore the ancient city of Pompeii on an affordable half-day guided tour. After a convenient hotel pickup, travel by air-conditioned bus to Pompeii, the Roman city buried by Mount Vesuvius’ eruption nearly 2,000 years ago. With an official guide leading the way, learn its devastating history and see its most important ruins before returning to Sorrento.